Electric products have greatly reduced the burden of housekeeping. 1956. Japan’s family life changed greatly during the high economic growth period. The year 1953, when the electric refrigerator, electric washing machine, and electric vacuum cleaner hit the market, was called the first year of the Electric Era. 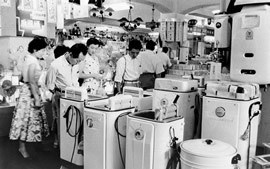 Later, washing machines, refrigerators and television sets were called the “Three Sacred Treasures,” and spread rapidly among Japanese households. The diffusion of electric appliances lifted some of the burden of housework from the shoulders of housewives. With a labor shortage due to economic growth, women who had passed the peak years of childrearing began entering the labor force as part-time workers. Currently, part-time labor is one of the major forms of employment for Japanese women. While only 12% of male workers are part-time workers, 46% of female workers are part-time workers, which means nearly half of working women in Japan are part-timers. In addition to the difficulty that married women with children have finding a fulltime job, the Japanese tax system rewards married women whose income remains below a certain level by treating them as dependents of their husband and keeping the family in a lower tax bracket. These factors contribute to the decision of many women to work part-time. Click CHART to see the age distribution of male and female part-time workers in Japan.